2 HP Replacement Air Compressor Pump for Campbell Hausfeld VT4823 Brand new two cylinder cast iron single stage air compressor pump. This is a 2 horsepower pump that will deliver up to 5.5 SCFM at 90 PSI. 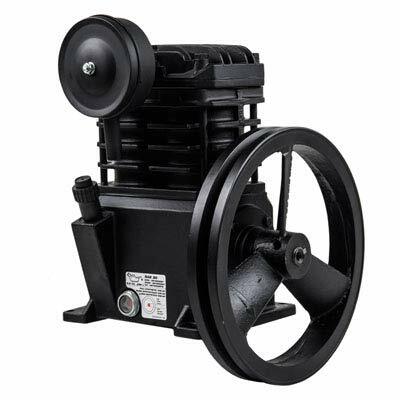 This pump is most commonly used on compressors under 40 gallons in size and can be used with a 110 volts or 220 volts two horsepower or larger motor. This pump comes complete as shown in the photos, including intake filter and pulley. See specifications below for more details. Part numbers referenced below are examples of what this pump will fit. However, there are many more models that it will work for. Use specifications to verify fitment. Specifications Two Cylinder Single Stage 2 HP Cast Iron Pump with Aluminum Head Equipped with Sight Glass for Easy Viewing of Oil Level Intake Threads: 1/2" FNPT Exhaust Threads: 3/8" FNPT Comes with Intake Filter Pulley Diameter: 10" Pulley Features Dual Set Screws for Secure Fit Oil Drain Hole Located Opposite of Shaft Weight: 34 LBS Up to 5.5 SCFM Good for Tanks up to 40 Gallons Designed to be a Replacement for Campbell Hausfeld Pumps and More Also Works Great as a Universal Replacement Mounting Hole Dimensions Center to Center Front to Back: 6-1/2" Side to Side: 5-7/8" Compatible Parts List Campbell Hausfeld VT500188AJ, VT627700, VT612902AJ, VT619602, VT619602AJ, VT629000, VT619604, VT619604AJ, VT470000AV, VT470200, VT203003, VT480000AV Speedaire 4B222E, 4B232B, 4B233C, 4B234C, 4B227E, 4TW29C, 4B227C, 4B228C, 4B229B Kobalt VT6361, VT6389 Husky VT631505, VT631505AJ, VT631506AJ, VT635800, VT636700, VT631538, VT631538AJ If you have questions about fitment or compatibility, please reach out to us before purchasing.